DURHAM, N.C. – Duke University engineers have developed a novel "sensor" that is more efficient, versatile, and cheaper for potential use in such applications as airport security scanners, and collision avoidance systems for aircraft, cars or maritime vessels.. The researchers fabricated a unique material, known as a metamaterial, that acts as a "lens" to image scenes using fewer components than conventional detectors. Because of the properties of this man-made material, much of the additional equipment needed for conventional detector systems – like lenses, mechanical positioners, and data storage or transmissions devices – are not required. The material itself is a thin laminate with row-upon-row of tiny squares etched onto copper, each one of which is tuned to a different frequency of light. In fact, the material is flexible and durable enough to be attached to a wall, wrapped around corners, or even laid on the floor like a rug, making it an inexpensive alternative for a variety of sensing applications. The new system works with microwave light and produces two-dimensional images. 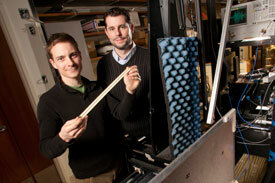 The researchers are currently exploring moving the technology to three-dimensional capability in real-world settings. The Duke researchers reported their findings Jan. 18 on-line in the journal Science. The research was supported by the Air Force Office of Scientific Research. "By taking advantage of the unique properties of these metamaterials, we were able to create a system capable of microwave imaging without lenses or any moving parts, " said John Hunt, graduate student working in the laboratory of senior investigator, David R. Smith, William Bevan Professor of electrical and computer engineering at Duke’s Pratt School of Engineering. As an example, Hunt said that in many security situations, imaging systems move a single sensor device with a small aperture in front of the body of the subject, creating an effectively larger aperture. The scanning waves travel through clothing, but skin or other objects reflect the waves. The new device can scan the entire field at once, which would allow for faster and more efficient screening, the researchers said. "Using conventional systems such as airport security cameras or collision detection devices, you have to wait for a scan to complete before you can see an image, while the new system can scan an entire range at once," Hunt said. The metamaterial is made of thousands of tiny "apertures" that can detect a wide spectrum of frequencies, allowing it to obtain a more global image of the scene, the researchers said. "Each individual element of the metamaterial is tuned to narrow frequency," said Tom Driscoll, a post-doctoral fellow from the University of California – San Diego currently working in the Smith lab. "Together the individual elements scan the entire range to capture information about a scene very quickly." "This system allows us to collect and compress the image during collection, instead of later, averting the detector, storage and transmission costs associated with conventional imaging of a scene," Driscoll said. Other Duke members of the team were Alex Mrozack, Guy Lipworth, Matthew Reynolds and David Brady.